Local storage — select this option if you want to save the backup on a removable storage device attached to the computer or on a local computer drive. With this option selected, you will pass to the Local Storage step of the wizard. Shared folder — select this option if you want to save the backup in a network shared folder. With this option selected, you will pass to the Shared folder step of the wizard. 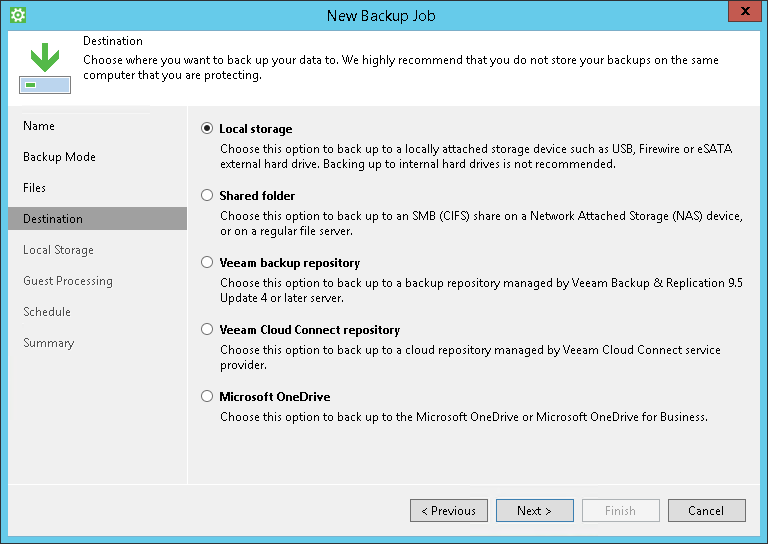 Veeam backup repository — select this option if you want to save the backup on a backup repository managed by the Veeam backup server. With this option selected, you will pass to the Backup Server step of the wizard. Veeam Cloud Connect repository — select this option if you want to save the backup on a cloud repository exposed to you by the Veeam Cloud Connect service provider. With this option selected, you will pass to the Service Provider step of the wizard. Microsoft OneDrive — select this option if you want to save the backup in the Microsoft OneDrive cloud storage. With this option selected, you will pass to the Microsoft OneDrive step of the wizard. It is strongly recommended that you store backups in the external location like USB storage device or shared network folder. You can also keep your backup files on the separate non-system local drive. If you select to store the backup on a local folder included in the backup scope, Veeam Agent for Microsoft Windows will automatically exclude this folder from the backup. The Veeam Cloud Connect repository option is available in Workstation and Server editions of Veeam Agent for Microsoft Windows if the Veeam Agent license is installed locally on the protected computer. The option is not available if you use Veeam Agent for Microsoft Windows with Veeam Backup & Replication, and the license is managed by the backup server.